The Wet Feet program is ideal for kids who have never set foot on a boat. These sessions allow kids to dip their toes in the water and get used to how a boat feels when it's in the water. Several kids sail in each boat with a coach boat alongside in our inner harbor. This protected environment allows kids to feel safe while meeting friends and trying a new sport. Wet Feet is great for sailors ages 5-8 yrs old. Requirements: Sailors should be between 5-8 years old. No sailing experience required. Children should be comfortable swimming in deep water. The maximum recommended weight for this program is 115 pounds, otherwise entry into our LEARN program is recommended. Sailors must wear a Personal Flotation Device (PFD) at all times near the water, including while sailing and swimming. Our Opti Beginner program focuses on getting kids on the water as much as possible. Starting small with several campers in a boat and a 1:4 camper to coach ratio, confidence on the water will develop quickly. Using fun, interactive games and 1-on-1 coaching, sailors learn the basics of safety, parts of the boat, and how to handle a sailboat. 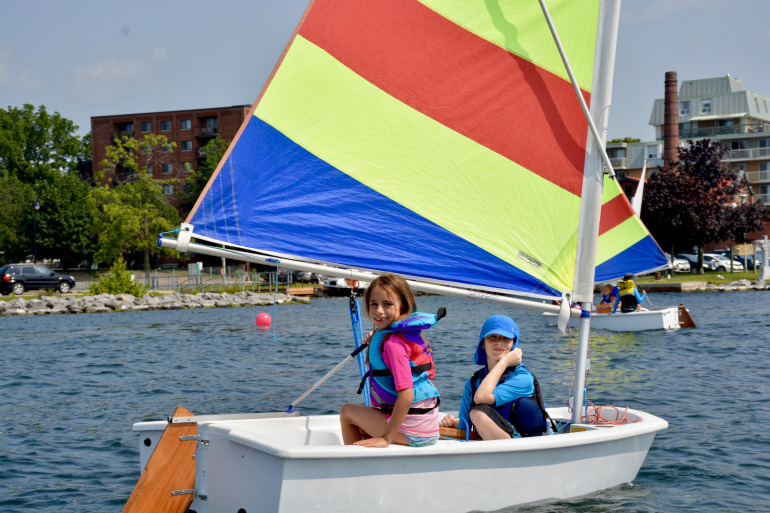 On top of sailing and coaching, each includes swimming, games in City Park, a trip to Cedar Island in Kingston Harbour for a BBQ lunch and a trip to White Mountain for ice cream. Requirements: The maximum recommended weight for this program is 115 pounds, otherwise entry into our LEARN program is recommended. Opti sailors are likely to take part in the Opti Beginner program for two or more sessions before moving into Opti Intermediate. Sailors will work on achieving an Opti Beginner level pass, but there is no guarantee that they will achieve their level in one year.Regardless, sailors will gain experience and enjoy hours on the water each session. Children should be comfortable swimming in deep water. Sailors must wear a Personal Flotation Device (PFD) at all times near the water, including while sailing and swimming.